f.Row may be the best way to go if you want a compact, economical and low-maintenance rower machine. Its full motion rowing arms mimic the action and position of real water rowing. It futures the latest technology when sync to our free fitbill Android or IOS fitness app. You can monitor and track your workout or even body weight on the app. 180 days of trainer plans help give you step-by-step guidance and motivation you need to reach your fitness goals. INNOVATION MEETS CLASSIC - New model released on 10/29/2018. 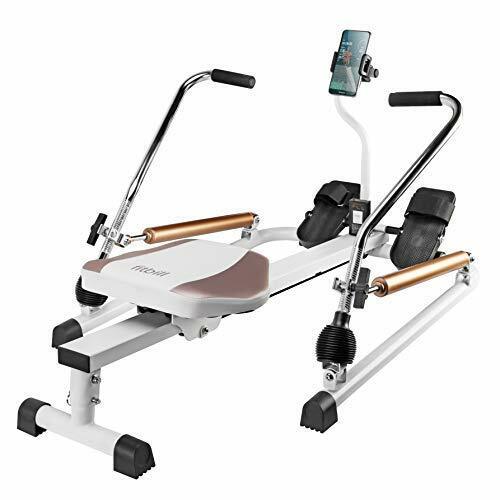 f.Row hydraulic rowing machine inherits the classic rowing machine design. Crucially, though, all details are redesigned. It is now a revolutionary rower! THE SMARTEST ROWER EVER - Bluetooth speed sensor detects your motion and syncs the data to fitbill app. You will be able to see your progress and keep motivated by tracking the data. NOTE: In order to work, please enable phone, storage and location permissions for fitbill app. Location permission is required for Bluetooth syncing. FULL BODY WORKOUT - 8 levels of resistance and an additional bungee band give you both upper and lower body workout. QUIET & MAINTENANCE-FREE - Operating sound <30db; Less noise and low maintenance compared to other type rower machine like air, magnetic and water rower. If you have any questions about this product by fitbill, contact us by completing and submitting the form below. If you are looking for a specif part number, please include it with your message.